Hugo Chavez, the president of Venezuela, is busting his buttons today after a series of Bush-Bashing events over the last few days. What can make a Marxist thug prouder than to successfully distract the world from his own shortcomings by unleashing a tirade of venom against the leader of the most powerful nation on Earth, and to do so on that nation’s own soil? Wow! What a man! But not everyone is enamored of Senor Chavez’ comments, and not everyone is distracted by them. Yours truly belongs to both groups. I have already condemned his comments as the low-class drivel that they were, so now let’s take a look at what he doesn’t want to talk about and hopes no one will notice. Venezuela is a very troubled country. It’s mildly democratic character has been weakened over the last two decades, and sources familiar with the conditions in the country report that political polarization, a politicized military, drug-related violence along the Colombian border, increasing internal drug consumption, overdependence on the petroleum industry with its price fluctuations, and irresponsible mining operations that are endangering the rain forest and indigenous peoples are all subjects of concern. The country also has substantial health and sanitization problems. The United Nations reports that 32 percent of the population is without adequate sanitation, and that a majority of people in many rural areas lack this basic commodity. There are approximately 5 million of Venezuela’s 25.7 million people living without access to safe drinking water, resulting in Venezuela ranking among the poorest nations in South America. Visitors are advised to obtain vaccinations for a variety of diseases including typhoid, yellow fever, cholera, hepatitis A, hepatitis B and hepatitis D before going to Venezuela, and are advised to drink only bottled water, due to the prevalence of cross contamination of drinking water with untreated sewage. In 1999 it was estimated that 110,000 people in Venezuela were living with HIV/AIDS, and the country recorded an estimated 4,100 HIV/AIDS deaths in 2003. The economy has shown similar difficulties. Venezuela continues to be highly dependent on the petroleum sector, accounting for roughly one-third of GDP, around 80% of export earnings, and over half of government operating revenues. Government revenue also has been bolstered by increased tax collection, which has surpassed its 2005 collection goal by almost 50%. Tax revenue is the primary source of non-oil revenue, which accounts for 53% of the 2006 budget. Heavy taxation and a volatile major industry do not for economic security make. Venezuela’s public debt runs about 32 percent of GDP, and a two-month national oil strike in late 2002 and early 2003 temporarily halted economic activity. The economy dropped 8.9 percent in 2002 and remained in depression in 2003, dropping by 9.2 percent. Senor Chavez and Venezuela have benefited from the hike in oil prices and strong consumption growth in 2004-2005, and the recent price hikes, but both inflation and unemployment remain fundamental problems. Approximately 12% of the population was unemployed in 2005, and nearly half (47%) of the population is below poverty line, according to a 1998 estimate. Venezuela is a small-scale illicit producer of opium and coca for the processing of opiates and coca derivatives. However, large quantities of cocaine, heroin, and marijuana transit the country from Colombia bound for US and Europe and significant narcotics-related money-laundering activity, especially along the border with Colombia and on Margarita Island exist, and there are increasing signs of drug-related activities by Colombian insurgents on the border. Ecologically, sewage, oil and urban industrial pollution, deforestation and soil degradation, and a threat to the rainforest ecosystem from irresponsible mining operations are all on the long list of things that make Senor Chavez prefer the comfortable confines of New York City to the nation he heads. 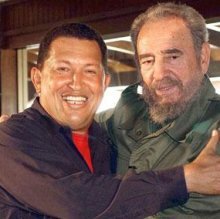 Senor Chavez is considered a big, brave man by leaders of the other failed naions in the United Nations for his graceless remarks, and is considered a champion of the poor by those who would rather blame someone than do something. 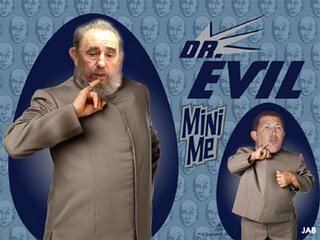 Clearly, Senor Chavez has plenty of poor people suffering under his misleadership to keep him busy. But he is too busy admiring himself in the mirror and doing hat tricks at the U.N. to notice. Maybe he will be the Time Person of the Year.